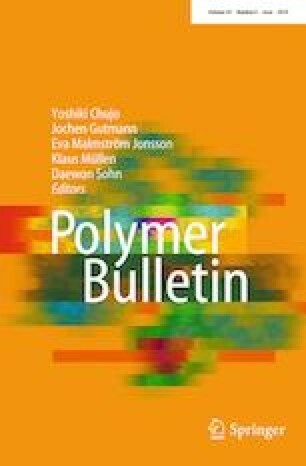 Herein, the effect of polyhedral oligomeric silsesquioxane (POSS) on compatibility, crystallization and thermal stability of polylactic acid (PLA)/polycaprolactone (PCL) blends was investigated. Scanning electron microscopy results revealed that the blend morphology became finer and much more uniform once lower contents of POSS were used. However, the compatibility level was notably reduced once the nanoparticle content increased which was attributed to the lower dispersion quality of POSS at higher concentrations. Differential scanning calorimetry results showed that lower contents of POSS suppressed the solution crystallization of PLA component due to the enhanced interactions between PLA and PCL as a result of the improved compatibility. However, at higher POSS contents, nanoparticles’ nucleating effect became dominative leading to a higher degree of crystallinity. Thermogravimetric analysis showed that lower contents of POSS (1 and 2 wt%) greatly improved the thermal stability of the blend. Apart from the heat shielding role of POSS, the higher level of compatibility and, thus, more interactions between PLA and PCL were also responsible for the improved thermal stability since PCL is much more thermally stable than PLA. In conclusion, the nanoparticle-induced blend compatibility could impose positive and negative influences on different properties of PLA/PCL systems, which needs to be further investigated.